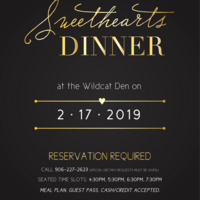 The annual Sweethearts Dinner will feature a four-course gourmet meal. Served in the Wildcat Den, a special menu of mocktails will also be offered. Four seating times are available: 4:30 pm, 5:30 pm, 6:30 pm or 7:30 pm. Reservations are required and now being accepted via phone: 906-227-2623.